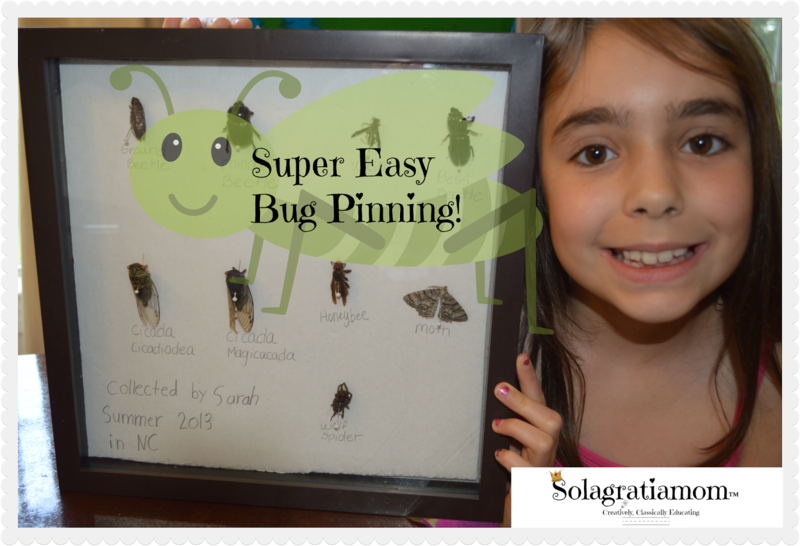 Solagratiamom: Super Easy Bug Pinning! Disclaimer: If you are a serious bug person, then you may want to close your eyes quickly...because I'm about to do what will cause you to gasp in horror! I pinned bugs without the right pins, without the right board, without noting the concordance, date, species etc. I did do some things right though. LOL! I did catch each bug last year and put them in rubbing alcohol to preserve them before I froze them. :) However, that's as far as the politically correct bug pinning goes. If you've been following me, then you know that Sarah and I do a lot of nature walks and bike rides to check out all God has created! We love the time outside looking at the amazing variety and beauty God has put right in front of us. 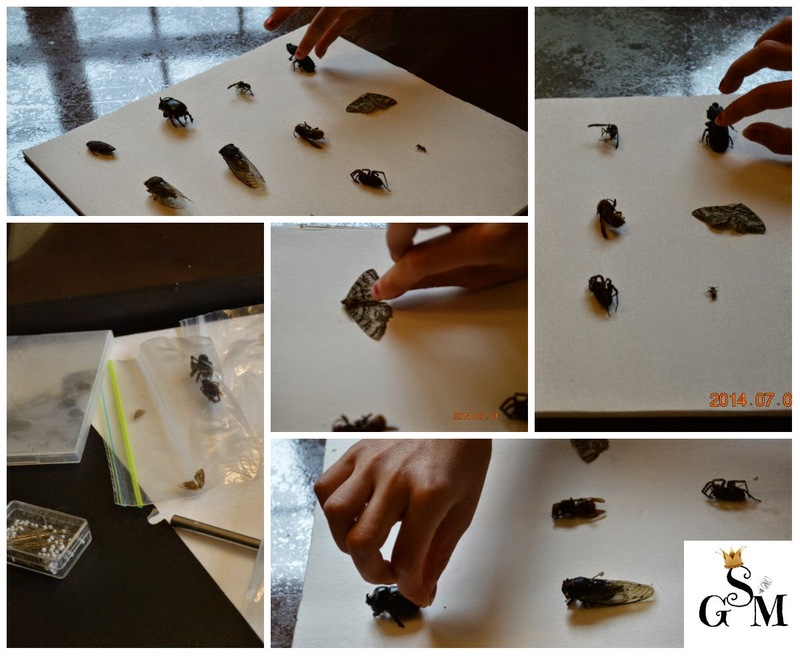 Last year, we collected a bunch of bugs that Sarah felt were unique or liked, with the intention of pinning them at the end of the summer. Well....life got busy and the bugs got put in the freezer in our basement and never made it to a board to be pinned! Instead, they terrified any guest who was unfortunate enough to open my freezer in the basement! Like the time a frozen spider fell out of the side door upon opening it-that guest was a bit alarmed to say the least. I froze them because I knew that at some point, life would slow down and we would have the time to pin our bugs! So, why do I say it's super easy bug pinning? Well, because I followed none of the rules of pinning bugs officially which is a bit time intensive. If you want to do it correctly then all the information you need is at http://extension.entm.purdue.edu. A helpful webpage about bugs for kids is over at Scholastic. If you just want to have some neat looking bugs that are able to be viewed for your kids - then this is an easy way of keeping visual record of what they've collected. Granted you can't enter them into a Science Fair or State Fair 4h -but it's easy, fast and it works just fine for home purposes. 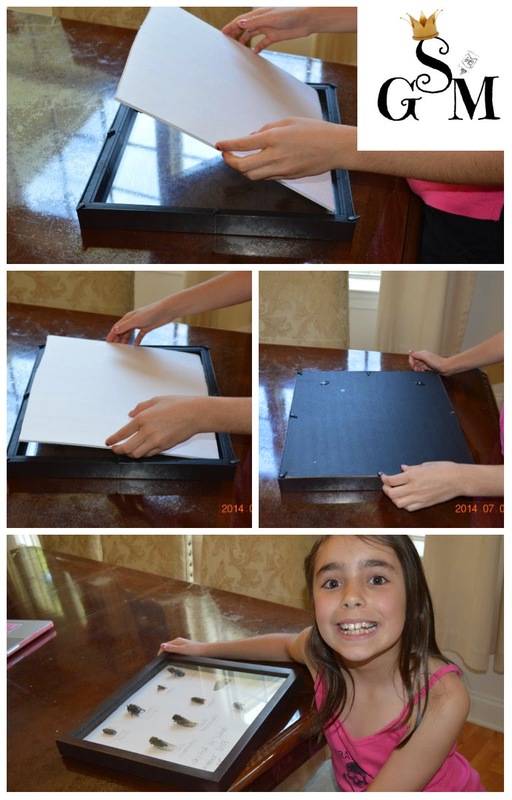 The first thing I did was cut the foam board to fit inside my shadow box. Then I thawed my bugs (only takes a few minutes) and placed them on the board where we wanted them. Next we got out our pins to begin pinning them. The biggest thing to be careful of is that they will break if you push on them hard. I had to do the body pinning of the bug -pushing it through to the other side- and then hand it to my daughter to stick gently onto the foam board. We did break a few smaller bugs and threw them away. There was also a leg or two that came off the bigger bugs while pinning and we got hot glue and tacked those back on no problem. Lastly, Sarah looked up and wrote the bug name under each one. Then we placed it into the shadowbox gently and put the back on. Lastly, we need to put silicone sealant around the glass and the back of our shadow box to seal it up. This will preserve them. It was fun and easy peasy! If you just want a visual collection of all those bugs your child has brought to you and wanted to "keep", then this is the super easy, fast way to go! Love it! We are just wondering how to do this!! I literally just looked up books. I think the sites would work better as my 7 yr old does want to enter them in the fair. :) Thanks so much!